Pagely specializes in premium managed WordPress hosting for enterprise clients. They serve many recognizable big brands, including Verizon, Garmin, Disney, Time Inc., Meetup, and PetSmart. See our expert Pagely review to decide if it’s the right choice for you. As the first provider of managed WordPress hosting, Pagely offers completely customizable hosting and top-notch expert support. They will help you maintain the top levels of security, page speed, and uptime. We use Pagely to host our OptinMonster application that serve several billions of impressions every month. Pagely began as a small web design agency founded by Joshua Strebel and Sally Strebel. The company created their first managed WordPress hosting platform for their customers in 2006, and began to specialize in the service exclusively in 2009. Pagely is headquartered in Phoenix, Arizona. Pagely offers five different levels of managed WordPress hosting, as well as six preconfigured Enterprise WordPress Hosting plans. They can also create customized Enterprise WordPress hosting plans to fit your requirements. The Neutrino plan is Pagely’s entry-level basic plan. Setup is instantaneous and you can host up to 5 websites. Enterprise hosting plans are available for high availability, disaster recovery, and extreme high traffic needs. Custom clusters can be provisioned at any size. The Enterprise tier is backed by Amazon Web Services and has had 99.99% uptime since it was launched in May, 2014. In our Pagely review, we found that Pagely is simply unmatched in the quality of their hosting services. You won’t find another web host that offers such comprehensive features for websites with high traffic demands. Pagely’s support team consists of WordPress experts. They don’t have support tiers, which means you don’t have to wait for your ticket to be escalated to the right person. Instead, every support team member has the expertise and access to help you with any issue. Every hosting plan can access support 24/7 via a ticket system. VPS plans also include live chat support right from within your account dashboard. Live chat support is only available Monday through Friday, 8-5pm. Enterprise customers get access to a private Slack channel for support. 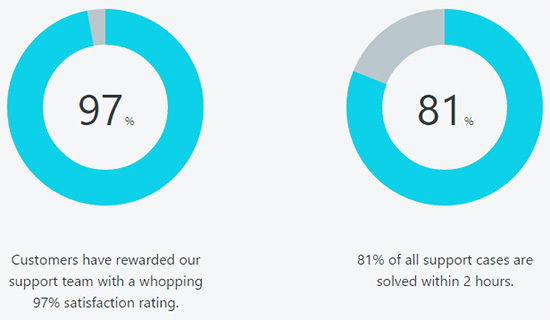 Pagely support resolves 81% of cases within 2 hours, and has a 97% satisfaction rating. In addition, all plans except Neutrino include an onboarding process. New customers are assigned an onboarding agent to help ensure your scheduled launch happens on time and as planned. Pagely has developed specific technologies to maximize the speed of your WordPress site. PressCache is a global network of DNS routed cache nodes designed specifically for WordPress. It works similarly to a CDN, except that it’s specially designed to cache and serve WordPress pages by loading them from one of Pagely’s global PoPs (Point of Presence) closest to the user. PressCDN is Pagely’s custom CDN built just for WordPress. It’s powered by MaxCDN and other service providers for more efficiency and faster load times for your users. PressCache and PressCDN are included with all of Pagely’s hosting plans. Pagely offers a 30 day money back guarantee. You can cancel your account for any reason within the first 30 days after signing up, and receive a full refund. Pagely is a popular web hosting company, but it may not be right for everyone. Consider these pros and cons before choosing a plan. Customized for WordPress – Everything included with your Pagely hosting plan has been expressly designed for WordPress, from the servers to the CDN. This means your site will load as fast as possible, even under extreme traffic loads. Save Time With Managed Hosting – Instead of spending all your time keeping your site secure or optimizing your page load times, you can focus on your business. Expert Support – Pagely offers real expert support, so you don’t have to waste time waiting for your ticket to be escalated to the right person. Any issues will be resolved quickly and skillfully. Premium Pricing – You get what you pay for, and Pagely is no exception. Their super-powered hosting and expert support is not cheap. But it’s worth the investment if a run-of-the-mill host can’t handle your site’s requirements. Banned Plugins – Pagely prohibits the installation of a small list of plugins that can pose performance problems for your server, including many caching and backup plugins. However, they provide caching and backup services with their hosting plans. Live Chat Support Not Available 24/7 – Pagely offers live chat support only during business hours. You can open a support ticket 24/7, and most are responded to within minutes. Is Pagely Right for You? Now that you have read through our entire Pagely review, you might be wondering whether Pagely is the right web host for you. After reviewing Pagely services in detail, we are awarding them with the title “Best Enterprise Hosting”. For larger companies with high traffic needs, no other host compares to Pagely. They offer incredibly fast and secure hosting that can handle even the biggest traffic spikes. Pagely’s support model is also unique among hosting companies. Every member of their support team is an expert with the skill and ability to help you solve any problem. Ready to get started with Pagely? Click here to select your Pagely plan today. I have used literally every managed WordPress host out there and I can say that Pagely is where I hoes majority of my WordPress site they are simply superior to everybody else there VPS amazing Redis, Nginx, Varnish & HHVM can’t be beat. Their standard service is just as amazing. When planning our 9th year of Decibel Festival, our most ambitious event yet, we sought out a WordPress hosting partner that could handle the crush of traffic as we announced our festival lineup and Decibel goers flocked to the site for information. Page.ly delivered above and beyond our expectations, proactive with performance suggestions and totally on the ball. Highly recommend! I’ve been using WordPress for over 8 years and I am so happy to use Page.ly at work. On other hosts I’ve had hacking, data loss and outages, but with Page.ly I know that they optimize their hosting to maximize WordPress’s performance. I absolutely love what Page.ly does. When it comes to speed, Page.ly blew other hosts I tested out of water.